One aspect of globalization is that some holidays have become internationalized. That is certainly the case with Thanksgiving Day, a distinctly North American feast day that is often celebrated around the world on the fourth Thursday of each November. In all events, divine intervention may not have been at work on the first occasion of a celebration of bountiful harvest that marks this day of feasting. As it turns out, the worldly basis for the first day of Thanksgiving involved changes in the economic system that had guided activities in a colony of pilgrims. To fully understand this assertion, one has to consider an accurate account of the pilgrim’s progress. In the first instance, some historical misperceptions must be cleared up. Every American schoolchild knows that in November 1620, a small band of pilgrims landed in Massachusetts and founded New Plymouth. Many Americans seem to recollect, or were taught incorrectly, that these pilgrims celebrated the first Thanksgiving with their Indian friends. 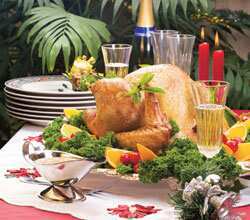 While there was a three-day feast that took place after a shooting party in the fall of 1621, it was not the first Thanksgiving Day. Although many of the pilgrims owed thanks to local Indians who taught them indigenous practices such as fertilizing corn with fish, the original Thanksgiving did not include their aboriginal friends. The harvest celebrated at the first Thanksgiving occurred later, after the pilgrims abandoned a form of agricultural socialism they had implemented upon their arrival. In large part, the first Thanksgiving was a celebration of the bounty arising from the pursuit of individualism and incentives associated with free markets. The background for understanding Thanksgiving Day is found in records kept by the governor of the colony, William Bradford. He informs us that the pilgrims’ English sponsors arranged for all crops and goods to be held “in the common stock"?from which they would be supplied, reflecting the religious beliefs of the colony. As with many other recorded applications of communalism, there were disastrous results. Governor Bradford wrote that this experiment reflected a belief that common ownership of property would allow the colony to flourish. Instead, it was soon found that communal sharing resulted in unintended consequences. The pilgrims, as the Soviets discovered several centuries later, found that individuals work harder within an incentive system that allows them to maintain and enjoy the fruits of their labour. The pilgrims’ initial experience mirrored the unfortunate experiment in Jamestown, where half of the original settlers either starved or fell victim to disease. With the pilgrims facing the prospect of a famine in the early months of 1623, they called a meeting to look into ways to escape near-certain death by starvation. Their decision was to abandon their communist arrangement for the distribution of goods on the basis of “from each according to their means, to each according to their needs". Instead, according to Bradford, from then on, “they should set corn every man for his own particular need." These new arrangements provided only a limited form of property rights, since land continued to be held commonly. Nonetheless, each family had a parcel of land to cultivate and they could keep what they grew, even if they could not deed the land to their heirs (similar agricultural reforms were initiated in China in 1978 under the direction of Deng Xiaoping. After centuries of cycles of famine, China has become self-sufficient in many foods and a net exporter of others). Although it was recorded that the American colonists exhibited a dramatic increase in industriousness, these were offset the following summer by the effects of a drought. Following the convictions of their religious beliefs, they offered appropriate contrition for their sins. The drought ended and the harvest was saved. And so it was that the pilgrims set about to celebrate a “day of thanksgiving" that Americans continue to celebrate to this day. Their new economic system that relied on individual efforts ensured they would be able to produce enough food for the future. This system continues to thrive within the freedoms enshrined in America’s national heritage. Remembrances on Thanksgiving Day should not be limited to the pilgrims’ offering of thanks to God for the rain that saved their crops. It also provides an opportunity to praise the institutions of individualism, private property and liberty that make the US such a rich and welcoming country. In fact, all wealthy and advanced industrial economies possess similar institutional arrangements that underpin their success and lay the groundwork for continued good fortune. And for that, they should all be thankful.